I'd like to say a massive THANK YOU to Laura Walker and everyone I met from Filton Hill Primary, St Michael's Primary, Holy Trinity Primary, Baileys Court Primary and Charborough Road Primary for the amazing welcome they gave me when I visited them all last week! 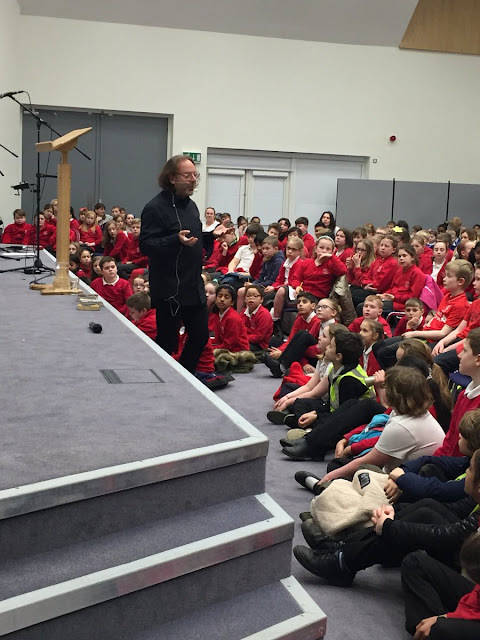 This was a really special visit, because it brought together around 360 children from five different schools in Bristol. Many of them had read or were reading Varjak Paw, and the level of excitement around the room was just fantastic. 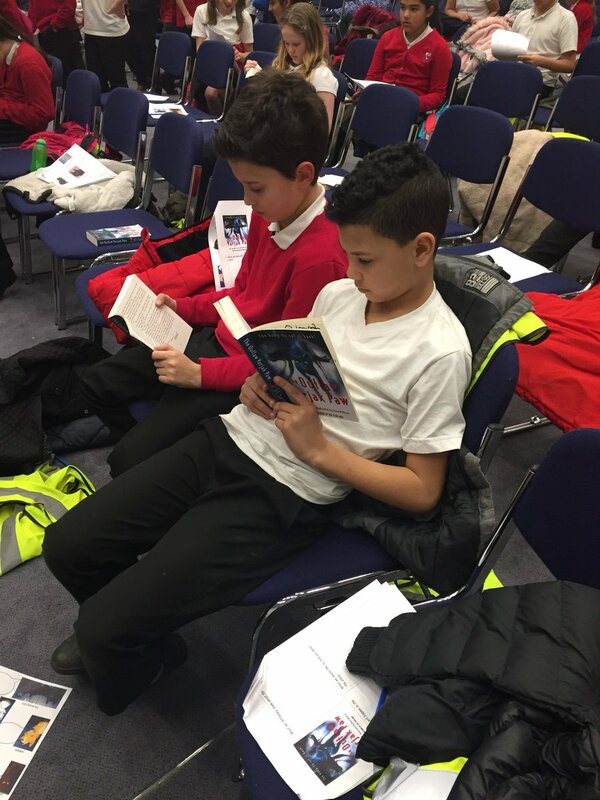 Some of them could just not stop reading! 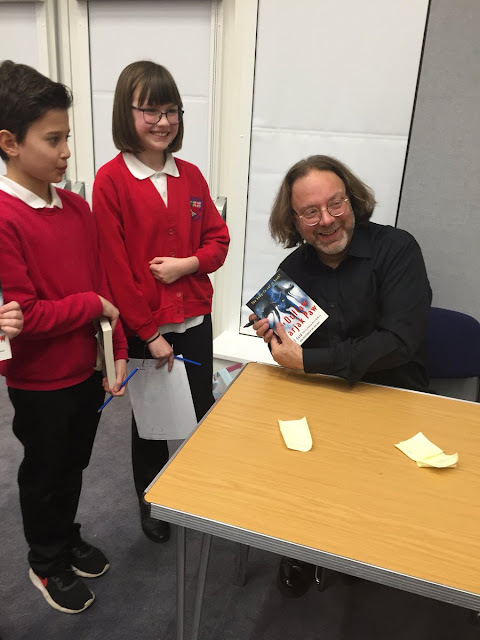 I loved talking to them about reading, writing and books, and hearing all their inspiring dreams and ambitions. They had many brilliant questions too! We didn't have quite enough time to answer them all, so if anyone would like to ask another question, or to say anything about the visit or my books, just leave me a comment below. It was a total pleasure to sign books for everyone who wanted them at the end of the day; you could really feel the buzz that the visit had created around reading! 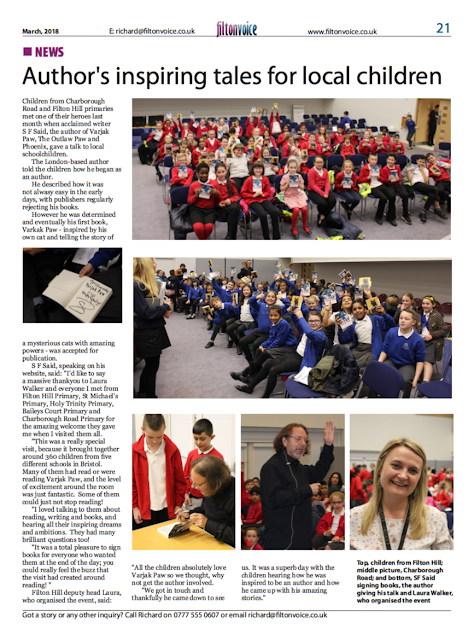 There was even a journalist from the Filton Voice covering it; here's his piece about it. And finally – THANK YOU again to everyone who made this such a special day! I am from from Bailey's Court and I met you.my favourite book is Varjak Paw. Thank you so much for your amazing message - it really means a lot to hear that Varjak Paw is your favourite book! I hope you enjoy The Outlaw Varjak Paw too.. I really want to ask will there be a Varjak Paw movie. Hi there. I am an avid fan of your Varjak Paw books! I remember in 2004, having the pleasure to read Varjak Paw for the first time, and in 2008, my 8th Birthday gift was both Varjak Paw and The Outlaw Varjak Paw. I have been scouring the internet since I planned to introduce my younger cousin to these books, and came across the news that the books may be developed into a film, and that you may write a third book. I have lost count of the amount of times I have read these books. Everything from the writing to the art style, to the general story keeps me hooked, no matter how many times I scour the pages. Both are starting to look a little worn, no matter how well I look after them. I am yet to read Phoenix, but have heard amazing things, and fully intend to purchase the book when I can.